About This Blog & Marti – Media! Tech! Parenting! 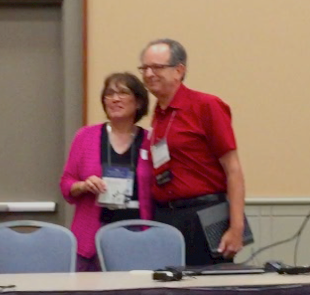 Receiving a 2015 Outstanding Educator Award from the International Association of Technology Educators (ISTE), presented by technology colleague Larry Kahn. If you are a parent, teacher, or other adult working with children, this blog aims to mentor you as you experience connected world challenges, helping you learn as much as possible about digital kids and how they can grow into thoughtful, collaborative, and savvy digital citizens. The blog’s mission is to provide context for adults — defining and clarifying digital world issues, examining 21st Century learning and parenting challenges, and sharing as much as possible about virtual environments and digital devices that children take for granted. It’s not really about technology anymore. Instead it’s about lifelong learning, collaboration, problem solving, and flexibility. and teaching kids they must follow the tenet of respect online as well as off. We can no longer talk about digital vs. non-digital world. Instead we need to understand that the world we live in a world that is digital and prepare young people to successfully live and work in it. As an educator who has received an International Society for Technology in Education’s (ISTE) 2015 Outstanding Educator Award, my aim for Media! Tech! Parenting! is to put my extensive experience to work — examining or reviewing digital news and information each week, surveying newspapers, blogs, research, and magazines, and exploring media, safety, and educational websites. Blog posts, as often as possible, provide links pointing readers toward the sites or publications covered in blog posts. As the principal Media!Tech!Parenting blogger and an educator with more than 25 years educational technology experience and more teaching in the classroom, I always look forward to speaking and sharing information with parents. In my professional life I focused on teaching kids, mentoring adults in a K-12 environment, along with all the digital world issues that challenge teachers, students, and parents. With more than 30 years of teaching experience I also supported the parents in my school by teaching three-five digital education/parenting classes each year, leading question and answer sessions, and maintaining current resources on the school’s website. I earned a Master of Science in Teaching degree from the University of Chicago. I enjoy presenting to parents’ groups and listening to parents’ concerns. Coaching teachers and helping them develop learning environments that are rich with 21st Century collaboration and problem solving. Helping students learn to use digital tools appropriately, understand their digital dossiers, and move – carefully – along the digital citizenship highway. Providing teachers, students and their parents added context that helps them evaluate media and learn more about how media affect their world. Please refer to the Disclosure Page for more information about this blog. When I review materials, books, websites, or other resources, I have no financial interest in any of them, and I have paid to turn off the advertising on this WordPress blog. While today’s information-packed world presents unique challenges to families and educators, learning as much as possible helps all of us become more effective advocates for children. Much is good about the 21st Century digital world — all that information at our fingertips — but we must also be clear about the time-tested values — respect, honor, integrity — that we want our digital native children to accept and cherish. A final note. If you have aging parents or elderly relatives in your life, you may also want to take a look at my avocational blog, As Our Parents Age. This much older publication has a similar philosophy, encouraging people to read and think about aging issues, adult children, and of course, 21st Century learning.